The Makita 9564CV 4.5-inch angle grinder is a strong stone grinder that has been specifically designed to handle all your stone polishing jobs. Its design achieves the perfect combination of performance, durability, and safety. Whether you’re a homeowner or a constructor, the Makita 9564CV will be a great addition to your arsenal to help you smoothen all surfaces. It’s both easy to use and safe in its operation. The Makita 9564CV comes with a powerful 12 AMP motor that delivers great output for grinding. The smooth starter guarantees that every start-up you execute when you’re using the grinder is as smooth as silk. Furthermore, the Makita 9564CV comes with a Super Joint System (SJS) technology that prevents any damage from getting to the gears if it binds or catches. 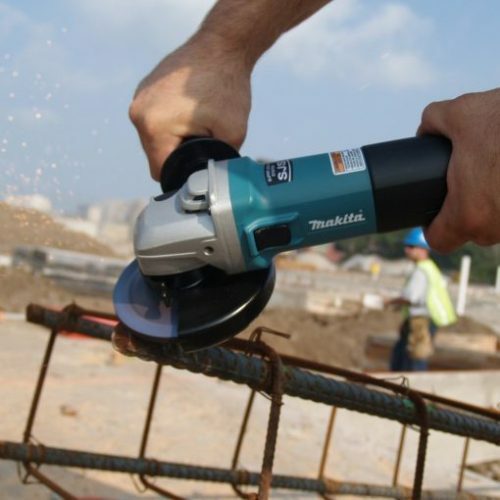 This technology is unique to the Makita angle grinder as it was designed to safeguard the motor and gears from any damage as well as the user from any injury that may occur due to the kickback of the grinder. Moreover, the labyrinth construction and zig-zag armature varnish isolates the gears and protects them from the debris and dust. The slide switch on top can be locked into position as you work to provide you with more safety. The tool-less wheel guard system allows you to change the position of the guard easily. This extends your safety as it means you’ll never have to remove the guard. You can set different rotations per minute with the 5-stage variable speed controller to get a range of variable speeds that allow you to work on different materials such as wood, stone, or metal. This also gives you more control over your stone-polishing so you can do it at your own pace and intensity. The Makita 9564CV surely has a lot of endurance because it comes with an electronic limited that makes it easy to maintain the motor of the grinder as it stops it when it overloads. This helps prevent burnout and extends the longevity of the motor. Thick wires are used for the armature coils to be more durable. Moreover, the Makita 9564CV has a streamlined design that’s strong enough to withstand all working conditions. It comes with an ergonomic design that makes it very easy to handle. Its lightness also contributes to that as it only weighs around 4 pounds. In addition, the side handles and wheel guard adjustments make clamping quite easy. However, you’ll need to use both your hands as you do grinding or polishing jobs. Finally, the side handle on the Makita 9564CV can be attached on either the left or right side according to your convenience. The Makita 9564CV is simply one of the best 4.5-inch angle grinders on the market. It’s quite powerful and integrates all the features you might look for in an angle grinder. It’s true that it isn’t that cheap, but if you’re looking for something that will perform superbly and last long with you, you won’t find anything better at such a price point.